Chiang Mai is a city in mountainous northern Thailand. Founded in 1296, it was capital of the independent Lanna Kingdom until 1558. Its Old City area still retains ruins of walls and moats from its history as a cultural and religious center. It's also home to hundreds of elaborate Buddhist temples, including 14th-century Wat Phra Singh and 15th-century Wat Chedi Luang, adorned with carved serpents. Thailand's northern capital is an escape from the whirlwind pace of life of its southern rival. Despite the constant arrival of planes and trains full of sightseers, the city is still blissfully calm and laid-back. This is a place to relax after the chaos of Bangkok and recharge your batteries with fabulous food and leisurely wandering. If you don't want to participate in the vast array of activities on offer, just stroll around the backstreets, and discover a city that is still firmly Thai in its aspect, atmosphere, and attitude. A sprawling modern city has grown up around ancient Chiang Mai, ringed by a tangle of superhighways, but if you drive in a straight line in any direction, you'll soon find yourself in the lush green countryside of northern Thailand. A short ride by motorcycle or chartered rot daang ('red truck') will deliver you to pristine rainforest reserves, churning waterfalls, serene forest wat, bubbling hot springs and peaceful country villages - as well as a host of adventure camps, elephant sanctuaries and souvenir markets. With so much to see and do, Chiang Mai is a great place to experience, and there are several options for bike tours to help you make the most of your time here. Start in Chiang Mai and end in Luang Prabang with an 11 day tour package taking you through 4 destinations in Asia. This tour includes accommodation in a hotel, an expert guide, meals, and transport. Travel by tributary and trail on this exploration through the remote jungles and mountains of tribal Thailand and Laos. The tour starts leisurely with a ride along the Ping River and heads to the handicraft center at Ban Tawai for some shopping. Enjoy the scenery as the trail winds from rice fields set among soaring limestone cliffs through villages of local hill tribes and continues along serene mountain trails. On back roads, ride through many small villages and see how the locals live and work. Enjoy a stay at a beautiful resort along the banks of the Mae Kok River. Ride straight to a Lahu village before hopping onto a boat for a leisurely cruise down the Mae Kok river. Leave Thailand behind, cross to Laos and spend a day relaxing on the Mekong River. Enjoy a private boat so where you can stop to visit some riverside villages along the way. Embark on an epic day of challenging riding on a broken track along the Beng River, through peaceful Lao villages and lush mountain scenery. Enjoy spectacular views in the central highlands across the rugged mountain landscape. Cycle through Hmong villages few people will ever visit and through some of the region's last remaining rainforest. Have time to take it easy on a boat ride down the Nam Ou River to the pleasant town of Nong Khiau. Cycle on along the Nam Ou River and stop at Pak Ou to visit the famous caves crammed with Buddha images. Then ride on to Luang Prabang to the hotel where your tour ends after a night's stay. This 8 day tour starts in Bangkok and end in Chiang Mai, stopping in 5 destinations with an expert guide included. From Bangkok to the northern capital of Chiang Mai, this cycling tour of Thailand takes you into the back alleys of Bangkok and then to the temples and cultural sites of the north. You will be guided on a fun exploration of Chinatown, through alleyways and winding pathways to see the street life of Bangkok. Then, moving north to Chiang Mai, you head right back into the markets on foot before starting off on the bikes to visit the many temples such as Wat Chedi Luang, Wat Phra Singh, and the oldest in Chiang Mai - Wat Chang Man. Near Chiang Mai you cycle to Doi Saket and the Lost City of Wiang Kum Kam, once the capital of the Lanna Kingdom. Stay in the Tree House Resort there and then continue on to Mae Taeng with some water sports, and then to Mae Rim and back to Chiang Mai for the finish. This cycling tour will feel like a self-guided trip, but in fact is guided and supported on all rides and so your local knowledge, experiences, and unique visits will be enhanced by a knowledgeable local guide. 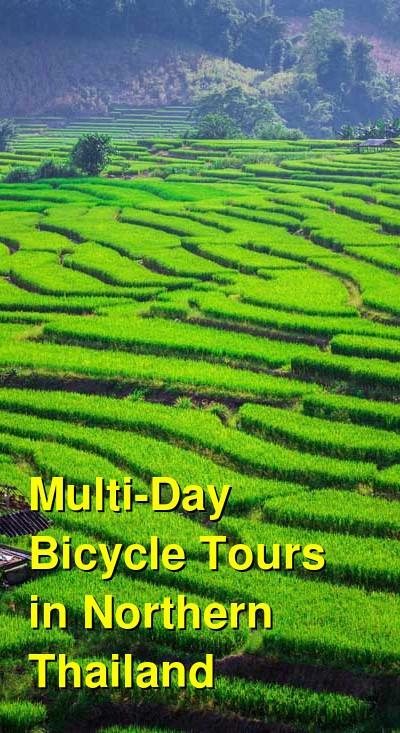 With this bicycle tour, you have a 6 day package taking you through Sukhothai, Thailand and 3 other destinations in Thailand with hotel accommodations, an expert guide, meals, and transportation included. This ramble through the north will take you from the 13th-century beauty of Sukhothai to the UNESCO-listed Kamphaeng Phet and onto Thailand's 'Rose of the North', Chiang Mai, via rafting on the Mae Chaem River, cycling through an artisan hill-tribe village deep in the mountains, kayaking to a floating restaurant on Mae Ngat Lake, and scrambling up limestone rocks at the Bua Thong Waterfalls. Explore the artisan Karen community of Li with a local biker to see silver jewelry and golden naga (mythical serpent) heads. Hike through a gorge and over a suspension bridge to see Stone Age pictographs and burial grounds of Ob Luang National Park. Scramble down Bua Thong Waterfall, aka 'Sticky Waterfalls', with its calcified rocks that 'stick' to your feet. End your exciting adventure in Chiang Mai with memories to last a lifetime. Start in Chiang Mai and end in Bangkok with 11 days of touring through 4 destinations, including accommodation in a hotel as well as an expert guide, meals, transport, and more. From the mountains and jungles of the North to the temple-filled plains of central Thailand, cycling through these regions offers unforgettable scenery and cultural experiences. Arrive in Chiang Mai with pick up from airport and transfer to hotel. Assemble bikes and enjoy some time in Chiang Mai or go for a warm up ride in the area. Leave Chiang Mai on the old highway and one of the oldest and most religious Chedis in Thailand, before a steep climb to Lampang -- the cowboy town. Ride through teak forests, past reclining Buddhas and some beautiful temples. Ride quiet country roads through rice paddies towards the first capital of Thailand, Sukhothai. Cycle around the historic park, a UNESCO World Heritage site with more than 193 ruins surrounded by three moats and bridged by four gateways. Ride to Khampeng Phet on pleasant country roads with plenty of activity going on to keep your attention before you reach the former military fortress used to help defend Sukhothai from invading armies. Continue towards Nakorn Sawan. Stop in Ang Thong to marvel at the 60-foot long reclining Buddha. See the old Siamese capitol of Ayutthaya - the center of old Siam for over 400 years until it was sacked by the Burmese in 1767 - and visit the temples by bicycle. Stop at Bang Pa-In, the former summer palace of King Chulakorn. Then enjoy a free day in Bangkok where your tour concludes.